Casa tradizionale a due piani con pareti in pietra e soffitti a travi in ​​tutto, offrendo un ambiente ideale per la creazione e il relax. Il giardino pavimentato in pietra dispone di piante mediterranee, alberi ed erbe e offre stupende vedute sulla valle e sulle montagne circostanti. Il piano terra è composto da una cucina / sala da pranzo, spaziosa e accogliente, con un tavolo da pranzo per 6; una sala a pianta aperta (30m2) con vista sul giardino e oltre, con un letto king-size e un salotto con angolo musica. Il bagno adiacente è grande e ben attrezzata. Per altre foto e una presentazione più completa, google stoneretreat Weebly, o cliccate sul link pietra Retreat Sito in fondo a questa pagina. Il piano superiore è costituito da una grande stanza (50m2) con soffitto a volta e camino con travi a vista, le sue 6 finestre con vista in tutte le direzioni. C'è un salotto con piano elettrico e home cinema e un grande divano che si ripiega in un letto matrimoniale con un materasso di cotone solido. Questa camera si affaccia su una terracotta emerso terrazzo (35m2), che si affaccia sul giardino ed è ideale per cene all'aperto e guardare le stelle. La proprietà e l'area circostante farebbero appello ad artisti, scrittori, amanti della storia, escursionisti e ciclisti seri, nonché a coloro che cercano la tranquillità. Per coloro che sono interessati a visitare la Grecia durante i mesi invernali, la casa dispone di riscaldamento centralizzato e un grande camino. Completamente attrezzato bagno spazioso, con grande, personalizzato progettato doccia su una piattaforma di legno. Estetica alta. Bancone in pietra con lavabo in ceramica fatti a mano. WC in locale separato. Asciugamani e prodotti forniti. Absolutes Traumhaus, sehr individuelle Ausstattung mit viel Liebe zum Detail. Christopher und Rosa sind tolle Gastgeber und stehen einem mit Rat und Tat zur Seite. Obwohl das Haus im Ort liegt, hat mal seine Privatsphäre. Wer Ruhe und Abgeschiedenheit sucht, ist hier richtig. Auch die Tipps und Vorschläge der Gastgeber für Unternehmungen in der Region sind absolut empfehlenswert. Stone retreat is one of those special quality places you will not forget. It has such good vibes. And the garden is so beautifull with the best views The house is convenient and fully equiped. Christopher is a very nice and warm person, he made us feel at home. Vrousti is small and the people make you feel welcome. We went in october, I can reccommend this, since there are not so many tourists in this season. The weather has been very beautifull and the sea warm enough to swim. I can reccommend snorkling above the sunken city, not only the romantic idea of it. There is a fine fish taverne next to it. I can recommend this place for couples and families who can appreciatie good taste, style and a homy quiet place. Wir waren mit unseren beiden Kindern (12&15) eine Woche im Stone Retreat. Das Haus ist wunderschön und äußerst geschmackvoll eingerichtet. Die Küchenausstattung lässt keine Wünsche offen. Das liebevoll renovierte Steinhaus liegt recht abgelegen in Vrousti - einem kleinen Bergdorf. 2 x am Tag kommen die Ziegen vorbei. Man kann sich an Feigen und Mandelbäumen laben aber zum nächsten Supermarkt oder nach Argos braucht man auch nur etwa 20 Minuten mit dem Auto, zum nächsten Strand etwas länger. Die Vermieter sind sehr herzlich und zuvorkommend und haben an alles gedacht. Es gibt gute Tipps, Kartenmaterial, Beschreibungen und eine kleine Grundausstattung an Nahrungsmitteln. Von den Nachbarn bekommt man nicht viel mit und wenn, dann sind es sehr erfreuliche Begegnungen. Ein Schriftsteller könnte hier sicherlich ein bis zwei Romane vollenden! Uns hat es sehr gut gefallen, ein Besuch im Winter wäre sicherlich auch ganz reizvoll! Alles in Allem: sehr Empfehlenswert! We absolutely loved our time at Christoper and Rosa's beautiful stone home in Vrousti. 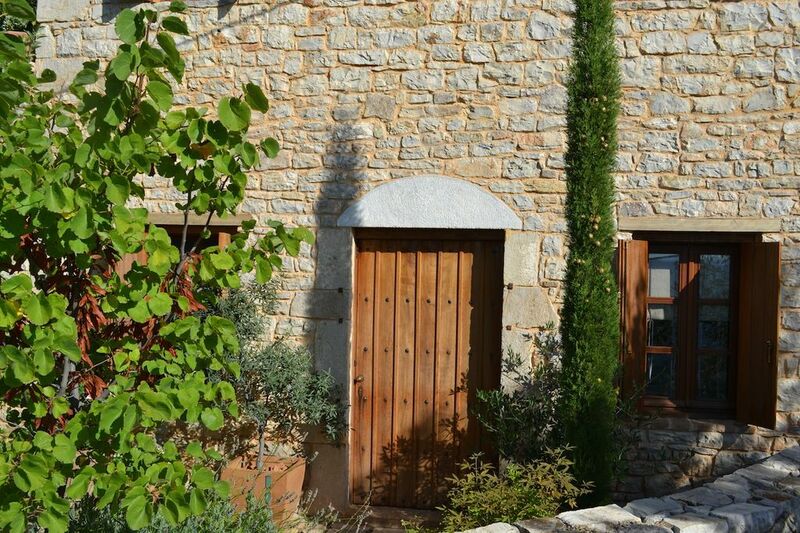 The home is gorgeous, stone walls beautifully outfitted with wood, with lovely and interesting natural art. Nice personal touches, this is clearly a home the hosts love and have invested a great deal of time and attention in -- and then luckily are willing to share! We relaxed, ate meals at the two patio tables, played with our two kids (age 4 and 6). Everything extremely well sign-posted and worked great, from how the water worked to how to hang the clothesline to helpful info on local spots of interest. Kitchen well-provisioned with dishes and items of character. Nearby towns of Argos and Nafplion are interesting with little shops, nice scale to figure out. The little village of Vrousti is very quiet, we took walks in the morning and evening when we heard the goats coming to and from their yard. While Christopher and Rosa were away during our visit, they were very helpful and communicative by email / text, and Voula (local lady who helps them) was incredibly warm and helpful despite the language barrier -- she generously gave us eggs, goat's milk and produce, along with lots of kisses for our kiddos. This lovely spot exceeded our expectations and remains a highlight of our month in Greece. We booked our rental over the winter holiday 12/26 - 1/2 - to avoid the crowds, the heat and take advantage of the kids winter vacation. The stone retreat is amazing! Nestled in a small village near Argos, it is charming, warm and quiet. Winter is the perfect time to stay in this cozy stone house - the central heat works quick and the fireplace is oh so romantic. There is outdoor dining areas that we took advantage of on New Years Day. A great record collection and all the comforts of home. We came with our two boys (7 & 9) and used the Stone Retreat as our home base taking day trips to Monemvasia, Hydra, Nafplio and Mycenae. The longest was about 2 hours away. You could also make Athens and Olympia in 2 hours. Christopher and Rosa are the ultimate hosts - leaving us a hot meal, bottle of local wine and some provisions for our first morning. They also can to our rescue when our rental car died. I am ready to buy a stone house and raise goats after our stay! Of course I’ll have to call Rosa to help me decorate! I’ve been using VRBO for 12+ years in the US and Europe and this was by far the best place I’ve ever stayed with the best hosts! The wonderful experience we enjoyed at the Stone Retreat is difficult to express in words. The Stone Retreat itself, its decor, and the views of both mountains and sea were more beautiful than can be shown by photos. The warmth of the hosts (Rosa and Christopher) as well as local community also made us feel immediately welcome and at home. We were overjoyed to be welcomed on our first day by the local delicacies prepared and brought by Rosa and Christopher, and later by the freshly picked fruit and fresh milk brought by a very kind neighbour (Voula). Our stay at the Stone Retreat was truly unforgettable; we hope to have the chance to return one day soon. Thank you both for your kind words. We hope to see you again! La nostra casa si trova in Vrousti, un borgo immerso tra le montagne di Argolida, uno dei centri più importanti della Grecia antica. Le importanti siti archeologici di Nemea e Micene, gli antichi teatri di Argo ed Epidauro sono tutti facilmente raggiungibili. Una fitta rete di sentieri di montagna parte dal paese e gli escursionisti potranno godere di una vista panoramica sulla zona circostante, mentre i ciclisti potranno godere di esplorare le numerose strade di montagna e sentieri. La città veneziana di Nafplion, situato all'apice del Golfo Argolico, offre un contrappunto ai ritmi pacifici Vrousti con i suoi deliziosi negozi, ampia varietà di ristoranti e vita notturna decisamente movimentata. La zona vanta una vasta gamma di eccellenti spiagge attrezzate per la maggior parte sport acquatici e punti di partenza per le rinomate isole Argo-Saronic di Idra, Spetses e Poros. Argo, la città più vicina principale, a parte il suo interesse storico, copre tutte le esigenze di shopping e comprende un vasto mercato contadino due volte a settimana.